Orly Smoked Out was a definite Must Buy for me this fall. Smoked Out is a gorgeous matte blackened teal with gorgeous lighter blue-green shimmer flecks. 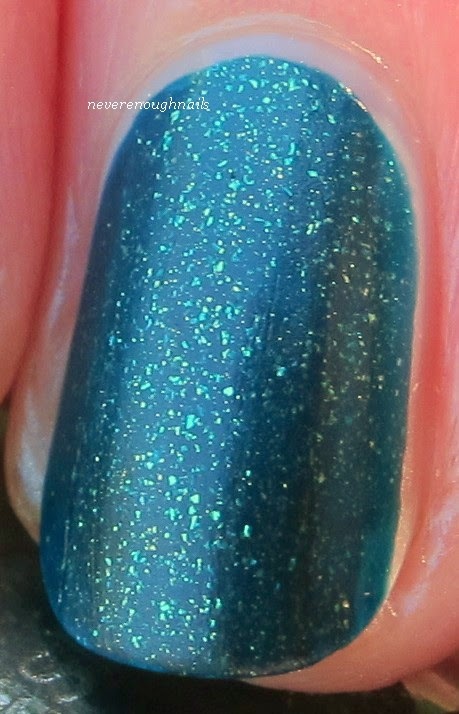 I love this kind of matte base with pretty shimmer in it and the dark teal shade is gorgeous. I think my pictures lean a little too blue, but teal is always a tough shade to capture. It's more green than most pictures I've seen, but it's also very deep and dark, so it has that great murky, is it blue or is it green? feeling. The pictures above are just two coats of Smoked Out, no top coat. It dries to a matte finish on it's own. Below, I layered on one coat of Sally Hansen Insta Dri top coat. It looks gorgeous shiny too! Smoked Out was pretty easy to apply. Like most mattes, it dries quickly so you have to work quickly on each nail. I love blackened teal anything and I also really love that this is a matte with shimmer. You can wear it shiny if you want, but you also have the option of wearing it matte without the use of a matte top coat. This is the first Orly I've purchased in awhile and it has me going back to look at past collections to see what other Orlys I should buy! It is really gorgeous and perfect for fall and winter Ananka! Love! Why don't I own more Orlys?